Once again I had a major life moment at Disney World — along with about 50,000 other people. I drove in the evening before the half marathon, which turned out to work really well. 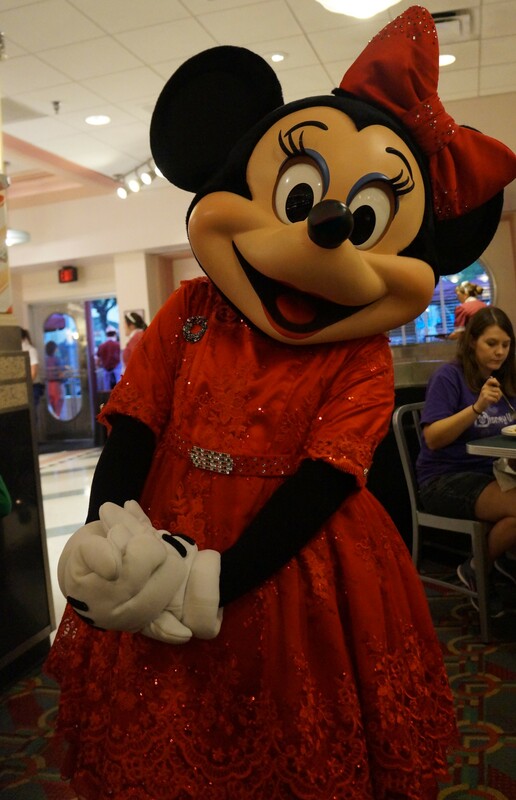 I arrived Friday evening and joined some of my friends for dinner at Beaches & Cream. This was a perfect way to take the edge off the nerves with laughter and French fries. I paid extra for the Runners Retreat. That was money well spent. 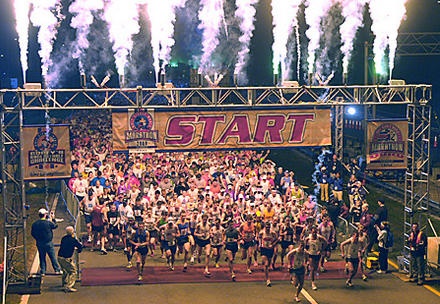 At 3:00 AM the Runners Retreat opened. The Runners Retreat is a heated tent with food, beverages, tables and chairs, Disney characters & stretching area. Other than running 13.1 miles, and getting up in the middle of the night, the hardest part of Disney races is the hours of standing around before the race. I sat in the Runners Retreat until they made us leave to go get in our corrals. After I had crossed the finish line and hung my precious Donald Duck medal around my neck, chatted with my stud muffin friends Laurel (who finished the race almost an hour before me and turned around the next day and ran the Marathon. Wow! ) and Len (who ran the Marathon) I headed back to the Runners Retreat. A hot breakfast buffet was available along with a variety of beverages. It was delicious. I don’t even eat sausage and I loved the sausage. You could also pay $1 per minute for a massage. The line was too long so I didn’t get one. I loved the Runners Retreat and will do it again. I’ll start saving now for next year. The January half marathon course is the same as the Princess with one big difference. You run longer in the dark during January Marathon Weekend. Our race began at 5:30 AM. It was a good hour before the sun came up. I wasn’t part of a team and I really wish that I was. After 3 half marathons I have realized the camaraderie & encouragement among the runners is what makes these endurance events fun. 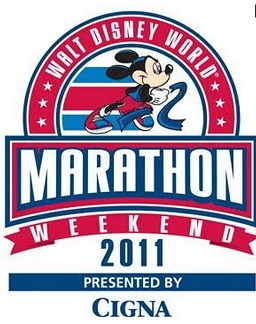 I loved Marathon Weekend. All the finishers wore their medals around for days after the races. We’d pass each other and say, “Congratulations,” or just give the knowing smile. Running bonds people. What a thrill it was to accomplish a goal that I never dreamed I could accomplish in the place I love so much. I almost didn’t register for Marathon Weekend. I am so glad I did. The spirit that runs through Disney World during Marathon Weekend is just a little different & very special – not just for the runners, but for the people that cheered from the sidelines. It was a victory for all. Caroline has a love of Disney that her family and friends don't quite get. Always ready for a trip to the Happiest Place on Earth or to do research for "The Unofficial Guide". Great job with the 1/2 marathon! I had a wonderful experience. Nothing beats the feeling of running up Main street to the castle with people cheering you on while the sun is rising. Next year please join Team All Ears Running with Purpose to raise money for Breast Cancer! I am with you 100%. I would love to joing ALL Ears team. Running for a cause. Thank you for reading and commenting. Hey Caroline, glad that you had such a good time. I was just outside the retreat that morning meeting up with other runners. Sorry we missed each other then. I have to absolutely agree with you on the camaraderie of friends and encouragement with the Disney running events (or, any event I suppose). The mutual cheering that we took part in back at Food and Wine was what made it not just a physical accomplishment, but a bonding experience. I am glad you had a chance to share in that at the Runners Retreat, and it is great advice for the “plus up” event for those considering doing it next year. Congrats to you again on your successful run! The encouragment is key to finishing these endurance events. At the Wine Dine in Oct, having friends cheering us on made a huge difference. 🙂 It was also really fun to be on the sidelines cheering. It’s very rewarding to celebrate others accomplishments. I missed that this race. Thank you for taking the time to read and comment. Thank you for the cheers!! Great race, Caroline. I saw you in the results for the half. Great, great work.